This is one in a series of guest posts by other bloggers. Read to the end for a longer biographical note on today's guest blogger, Amber from Birth Routes. Amber relies on the carriers in her natural parenting toolbox to keep multiple kids happy. 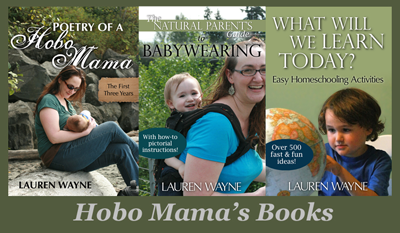 As the title states, I'm a babywearing nanny. I'm also a babywearing educator, but attached nanny is my everyday job — and I'd be completely lost without my multitude of carriers. I have 19 to be exact. That is a whole lot of fabric love. We've recently moved provinces with only 2 suitcases each, and as you can guess, my natural parenting books and carriers took up most of the 2 suitcases — I may have snuck my clothing in with my partner's allotted luggage (and he did nothing more than roll his eyes and lovingly smile). On my list of priority items, my carriers are top of the material possessions for sure. 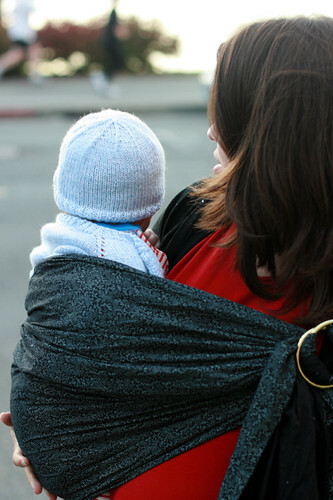 Babywearing is trendy, and pretty — but also so very functional. I simply do not know how I would "parent" two babies, age 1 and under, without them. You can often find me bouncing around the house while wearing one on the front and one on the back, to get them off to sleep. There is no way I'd be able to go up and down the steep flight of stairs at work while carrying a packed diaper bag without the assistance of a wrap or ring sling. And making lunch, or really doing anything that involves more than no arms would be impossible without babywearing. More and more they are content to play on the floor a bit while I'm doing stuff, but when they are done — the carrier it is for instant happiness. On Thursday, as I was ECing (elimination communication) the 8-month-old in a public washroom, with the 12-month-old flipped on my back in my ring sling — I burst into laughter. I am that woman — arms full of love, attending needs wherever we are. Both smiley happy babies. My thighs likely becoming toned, as I peek over my left shoulder and see little pearly teeth and bright eyes smiling at me as I chant "pee pee, pee pee," then "that's it!" In years past, I've thrown an injured-at-the-park and overtired 4-year-old in a back carry, to feel his head cuddle in and his body soften and relax. 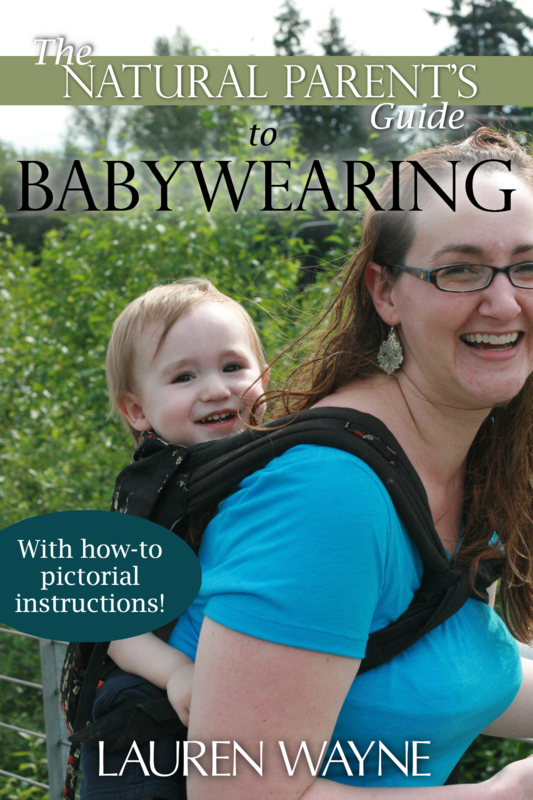 Babywearing as a nanny is like the magic tool to "parenting" that breastfeeding would be to a mother, or I assume. My toolbox of natural parenting is plump, but without breastfeeding, I rely a lot on carriers. That doesn't mean there aren't mishaps too, like the time I was trying to use the washroom with one on my back and one in arms on my lap, and I peed on his foot. He didn't seem to mind, but let me tell you, I am a far cry from perfection! And as I always say "I've never worn an unhappy baby" — they may be unhappy to start, but it doesn't last long. As often, eyes open doesn't last long, either. Amber Morrisey is a Birth & Postpartum Doula, Reiki Practitioner, Placenta Encapsulator, Babywearing Educator and Attachment Parenting Nanny to two little ones. You can read more about her adventures at Birth Routes. high fives all around from one attachment nanny to another!! i love my girls to pieces, but they're just 18mos apart and i sincerely don't know how anyone (especially a nanny who does not double as a wet nurse) can survive one baby, let alone two, without the use of at least a couple of sturdy carriers. i remember bumping into one of my then 3yr old's friends & her mum in the grocery store one day when their new baby was just a few months old. the mum was telling me she'd be going back to work soon and how hard it was to find a nanny willing to carry your baby. i started to protest (because it seems like the most natural thing in the world to me), but then i did a mental review and i could only count 3 other nannies in my acquaintance who used carriers on a regular basis. so weird to me...but you're right: i've never carried an unhappy baby either! take care, and thanks for the post! I WISH you lived close to me when I was looking for someone to watch (and wear) my first son when I went back to work. They wouldn't do it at his daycare, even when I explained how he really, really, really likes to be held and how much easier it makes your life. Now, with 2 kids of my own, I have no idea how I would do it without babywearing. There is no way. I don't know how anyone survives parenting more than one kid (or even just one, for that matter) without being able to wear them. You are a woman after my own heart!